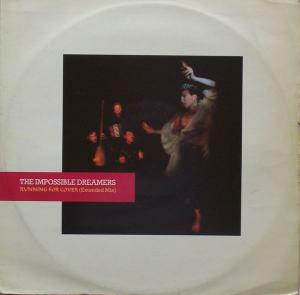 The Impossible Dreamers were a 1980s new-wave band that had a major club hit with their 12” single “Spin”, before signing for RCA Records, where they were produced by Johnny Marr (The Smiths). The Imps (as they were nicknamed) started off as several friends at Exeter University (c1980). By the time of their first RCA single, “This House Built On Sand”, the band were: Nick Waterhouse (gtr, vox)/Caroline Radcliffe (vox, oboe)/Justin Adams (gtr)/Fred Hood (drums). The band toured extensively (originally supporting bands including Kid Creole & The Coconuts and Bad Manners), and were courted by the NME (January 1983) and many other magazines. The quartet stayed together until 1987/8, before going their separate ways. Justin Adams is now a respected guitarist who plays (and produces) with the likes of Robert Plant. Fred Hood, a close acquaintance of Johnny Marr, has also been the drummer/writer/producer for The Pretenders and Moodswings, where he is often referred to as James FT Hood. “Running For Cover” was produced by Mike Howlett and remixed by Tim Palmer.